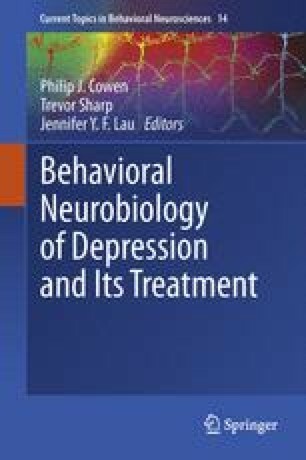 Major depressive disorder (MDD) is a complex illness and it is likely that alterations in several interacting systems underlie its pathogenesis. Numerous hypotheses have been proposed to elucidate its origins. The inflammatory hypothesis emphasises the role of psycho-neuroimmunological dysfunctions. This is based on several observations: subsets of MDD patients have an altered peripheral immune system, with impaired cellular immunity and increased levels of proinflammatory cytokines; cytokines can influence neurotransmitter metabolism, neuroendocrine function and regional brain activity, all of which are relevant to depression; acute administration of cytokines causes sickness behaviour which shares features with depression, and patients undergoing cytokine treatment develop depressive symptoms. In this chapter, we discuss the evidence linking inflammation and MDD, looking at data from clinical and animal studies, the role of stress, possible mechanisms and the involvement of genetic polymorphisms. Further understanding of pathways involved is still needed. This will be vital for the identification of new drug targets and preventative strategies. CMP has been funded by the UK MRC since 1999, first as a Clinical Training Fellow, and currently as an MRC Clinician Scientist Fellow. His research is also funded by the NIHR South London and Maudsley NHS Foundation Trust and Institute of Psychiatry Specialist Biomedical Research Centre for Mental Health, the NARSAD, the APIRE, the British Academy and the European Union Framework 7. PZ is funded by a NARSAD Young Investigator Award. The authors have no relevant financial interest to disclose.